After months of hearing how fabulous Adele is I decided to download her album 21 that was just released here in Canada yesterday. My facebook newsfeed has been filling up with Adele’s music videos, live performances and status updates about how brilliant she is. So, I decided to start my morning off with a new album. And after listening through it once- I repeated the entire album again. I LOVE it! Why am I only starting to listen to this lovely lady now? You know what’s just as easy as listening to Adele’s fabulous voice? 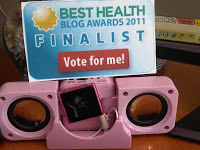 Voting for me in BEST HEALTH MAGAZINES BLOG AWARDS HERE! This entry was posted in Best Health Blog Awards 2011, http://schemas.google.com/blogger/2008/kind#post by Siobhan McCarthy. Bookmark the permalink. I voted (again) for you 🙂 You're totally right, this chick has such a great voice! Maybe it's because I'm in the US or maybe it's because I live under a rock but I actually have never heard of her! But her voice rocks. Thanks for sharing! Argh – I guess I finally need to see what all the hype is about now! Thank you so much for voting!! And I'm glad you like here! Page- Let me know if she meets up with the hype for you!